Dr. Schwartz, often referred to simply as “Dr. Jan” by staff and patients alike, is a Houston institution -- having practiced dermatology in the “Space City” for just over thirty-nine years. While she has earned a committed following, and has been delighted to treat families through several generations, she is also thrilled to oversee a constantly changing and ever-expanding practice. Whether seeing a patient out of medical necessity or assisting with cosmetic matters, Dr. Schwartz is committed to achieving the best result possible for each and every patient. Education Dr. Schwartz graduated from college at the University of Pittsburgh where she was an honor student, vice president of the biological honor society Tribeta, and a member of both Quax (The WomenÊ¼s Science Honorary) and Alpha Epsilon Delta. 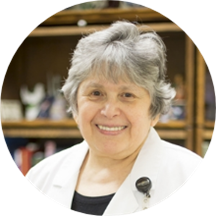 She graduated from the University of Pittsburgh School of Medicine in l968 and served as an internal medicine intern at the University of Texas Medical Center at Galveston from 1968 to 1969. Subsequently, Dr. Schwartz served as a Dermatology resident at the University Hospital of the Boston University Medical Center (as well as other affiliated hospitals) from 1968 to 1972. She began her private practice in Houston in January of l973. Accreditation Dr. Schwartz is a fellow of the American Academy of Dermatology and a member of the American Medical Association, the American Society of Dermatology, the Texas Dermatologic Society, and the Houston Dermatologic Society. She was first certified by the American Board of Dermatology in September of l975. DO NOT GO HERE. My appointment was at 2pm and it was 2:55 and there were still 2 patients in front of me. Time is valuable, but not here. Very nice every time I go.. would not change her or her team! I'm so glad that I chose to go to Dr. Schwartz. She is extremely knowledgeable! I had gone to 3 different doctors regarding my skin condition and was wrongly diagnosed by all 3. My skin worsened, so I decided to bookan appointment with Dr. Schwartz knowing that she has a lot of experience. Dr. Schwartz correctly diagnosed it and I am finally on the mend! My skin hasn't been this nice in many years! I highly recommend her! Dr. Schwartz and her staff were extremely friendly and made sure they were able to listen to all my needs. I liked the small office environment which is a nice change to some of these large dermatology offices. Dr. Schwartz dida small procedure and she was very through while making sure it was painless. She is very caring and considerate and took as much time as I needed. Would highly recommend her to all. I have been needing a dermatologist for some time. Dr Schwartz is extremely competent and kind. I felt at ease right away, had a small procedure in her office and another one scheduled. Front office staff, Drs assistant all lovely. I feel like I hit the jackpot. Thanks Zocdoc . Super long wait time (45-1 hour) even with appointment. Doctor still had me waiting in room. When she finally came in, she was short and did not take time to listen to me or explain what she was going to do.I wanted to remove some moles and she was really brief, did not explain any options to me, just froze them- which left me with huge and painful blisters. Now I have scars where my moles once were. Would not go back here again. She had me wait for a long time and then just breezed over me. Did not really explain any post care either. la consulta fue rápido y precisa, incluso la enfermera ya había sugerido el diagnostico. Me recetaron el medicamento para mi problema de la piel para 15 días, hoy solo hace 6 días y casi esta resuelto por completo. Gracias al equipomedico, incluida la recepcionista, todos muy amables. Sin dudas lo recomiendo y si yo tuviera algún otro problema con mi piel, volveré a esta consulta. The wait has been more than an hour. I’ve had issues with dermatitis before, and Dr. Schwartz fat shamed instead of addressing the immediate issue. Would not recommend. She was wonderful. There was an issue before me so I had to wait but she apologized and never rushed my appointment. Couldn’t ask for a better visit. She is the sweetest, straight to the point, and the most knowledgeable doctor of every type of doctors I’ve encountered in a very long time. She makes you feel like you’ve known her your whole life which is very important tome. I highly recommend Dr. Schwartz, she is a breath of fresh air! Very Professional and extremely knowledgeable. Answered all my questions and reassured me. Was my first office visit and I would highly recommend Dr. Schwartz to anyone needing treatment. I strongly recommended Dr. Jan. She is so polite and very caring. She was knowledgeable and friendly. The wait was worth it. Dr. Schwartz was lovely, kind, professional, fast, and competent. I really felt cared for by her when I left, and appreciative of her kindness. I am very pleased with the treatment from Dr. Schwartz. She is very thorough, considers all factors, and has a great bedside manner. This was my second visit. I rated the wait a 3 only because they had a difficult patientand got backed up. They apologized for the wait and thanked me for being patient. On the first visit, I was seen within 10 minutes. I would highly recommend Dr. Schwartz. Takes her time to listen to concerns and questions. The staff was extremely pleasant and helpful. There was a bit of a wai,t but I think that was unusual according to the receptionist . The doctor was great and time with her was quick and productive and personable. Terrible experience. Came in with a skin condition I have been noticing and looking for professional help with this. Her response to my concern was “only god knows what this is”. WHAT? I payed money so you can help me figureit out. Anyway would never go back. Not to mention I waited over a hour in the waiting room. The hospital was not that clean and it is very old. My visit was very pleasing. The front desk was very nice and conversational. Once I was seated in the room, I was in there no more than 10 minutes and then Dr. Dchwartz came in. She was very warm, and wasable to give me answers to my situation immediately. She provided me with several steps to stop my problem, and was very quick to let me know if I had any more questions/concerns to contact her. Overall, a very quick and succesful visit. She was super kind and interested in my well-being. This was the first time I came in for a visit, but plan on going in for a follow-up to see if her recommendation for my stubborn skin was effective. I’ve been a patient for several years and mostly have great experiences. The wait time was longer than usual (from what I heard due to unforeseen circumstances with one of the office managers) but I was not happy when I couldhear a man who had an appt after mine arguing with the front that he needed to be seen earlier than others because he had to be somewhere. I had already been waiting for an hour in my exam room and my appt was before his. I overheard the nurse finally give in and let him cut in front of those of us who had already been waiting. I felt like this was completely unfair. While the rest of my appt and experience with doctor Schwartz was great I felt like letting a rude and disrespectful patient cut in line was an unfortunate way to treat the other patients who patiently and respectfully waited for their turn. Very profesional and with knowledge of her specialization. She took the necessary time to check and made recommendations. What I really liked was how the doctor and her nurse were very thoughtful about the cost of my medications, and they made sure I got the best medicine for the most cost effective price.